The figure of Jesus Christ is undeniably a spiritual and cultural character of significant importance in human history. Jesus Christ is the pillar of one of the largest and most powerful religions of the world, which is probably why most people find it difficult to question the premise of the Christian faith. For many of us, it remains a mystery how much of what we are taught about the “Son of God” is true to the original figure that lived over 2,000 years ago. Over the centuries that passed and even in the modern times, there are those who believe that the Jesus Christ we know now is not who he was in reality, but is instead only a version of him that was institutionally adapted by the Church to fit its ideals. Stories about him, his abilities and qualities which were up to the premise established by the Church were kept, while those that didn’t were allegedly deemed fraudulent or inaccurate and were heavily discredited. Though the Bible had become canonized more than a millennium ago, many apocryphal stories have managed to survive and endure even up to now. More recently, a newly deciphered Egyptian text, which dates back almost 1,200 years, details a part of the crucifixion story of Jesus Christ with apocryphal plot twists, some of which have never been heard of before. In March 2013, reports flooded the headlines about a 1,200-year-old Egyptian text that tells the story of the life and crucifixion of Jesus, while also supposedly providing conflicting data that could potentially change the story about Jesus Christ. The text is written in the Coptic language, and is one of fifty-five Coptic manuscripts that were found in 1910 by villagers digging for fertilizer at the site of the destroyed Monastery of Archangel Michael of the Desert near Al Hamuli in Egypt. Apparently, the monk in the tenth century had buried the monastery’s manuscripts in a stone vat for safekeeping. The monastery ceased its operations around the early 10th century, and the text wasn’t rediscovered until around the spring of 1910. Then, American financier J.P. Morgan purchased it along with other texts in December 1911. His collections, and the particular text about the crucifixion story of Jesus, are currently housed and protected in the Morgan Library and Museum in New York City. A second copy of the ancient text is also available at the Museum of the University of Pennsylvania, but is mostly illegible. Based on van den Broek’s translation, not only does it describe Pilate as a faithful disciple and not a traitor, it also recounts a dinner with Jesus prior to his crucifixion in which Pilate offered to sacrifice his own son to spare the life of the Messiah. The text also controversially described Jesus as possessing the magical ability to change shape, which explains why Judas had used a kiss to positively identify Jesus. The ancient text also puts the day of Jesus’s arrest on Tuesday evening instead of Thursday evening, which contravenes the current Easter timeline observed by Christians. While apocryphal stories about Pilate are known to exist from ancient times, van den Broek claimed that he has never seen one before in which Pilate had offered to sacrifice his own son in the place of Jesus. The text also mentioned that Pilate and his wife both had visions that night that show an eagle - which is a representation of Jesus – being killed. According to van den Broek, this sympathetic portrayal of Pilate in this ancient text is unsurprising since Pilate is regarded as a saint in the Coptic as well as Ethiopian churches. In the canonical Bible, the apostle Judas betrayed Jesus in exchange for money and used a kiss to identify him leading to the Messiah’s arrest. While the text did not refute the apostle’s betrayal, this apocryphal tale did explain why Judas had to use a kiss to identify Jesus --- Jesus was allegedly a shape-shifter. This conundrum led Judas to suggest using a kiss as means to positively identify him. Had he simply given the arresters a description of Jesus’s appearance, the Messiah could have easily changed shape. But by kissing Jesus, Judas revealed to the people exactly who he is. The ancient Egyptian text also mentions that the date of Jesus’s Last Supper with the apostles and subsequent arrest took place on a Tuesday. In fact, in this old text, Jesus’s actual Last Supper was not with his disciples but with Pontius Pilate. And in between his arrest and supper with Pilate, he was brought before Caiaphas and Herod. This information is a significant deviation from what are written in the canonical texts. To present-day Christians, the Last Supper and the arrest of Jesus happened on a Thursday evening, and they observe the event every year as “Maundy Thursday” as part of the services of Holy Week. 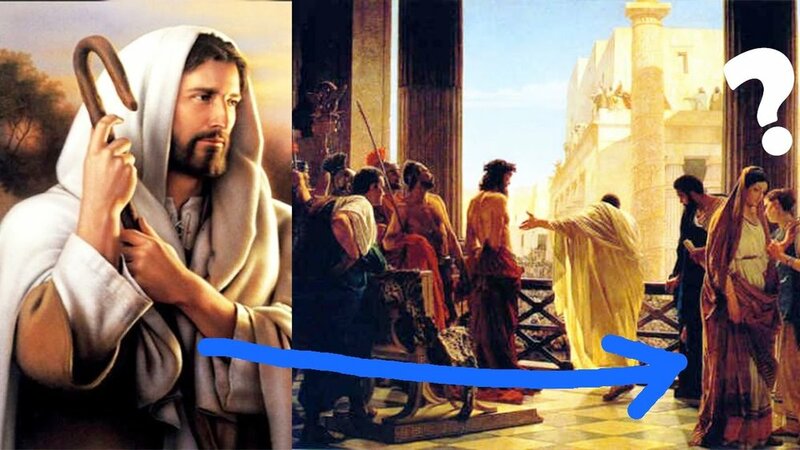 However, the way the Egyptian text relates the story of Jesus’s arrest to have taken place on a Tuesday evening makes it seem as if the canonical story about his arrest on a Thursday evening did not actually exist. So, with all these controversial and supposedly “earth-shattering” information about Jesus Christ, one very important question comes to mind: Is this 1,200-year-old ancient Egyptian text based on real life? To van den Broek, the answer is “not exactly.” For him, the discovery of the text doesn’t mean that the events detailed in it have actually happened, but that some people who lived at the time of the tale’s existence appear to have believed in them. Nevertheless, though the accuracy of the details written on this ancient Egyptian text is highly doubtful, the text itself is considered authentic. This meant that 1,200 years ago in Egypt – at a time in which the Bible had already become canonized – many still read and believed in various apocryphal stories to the point that books about them remained popular among Egyptian Christians, especially among monks. And so, this ancient Egyptian text, while not a reliable source of information about the real story of the life and crucifixion of Jesus Christ, offers us a glimpse of what people people thought of and believed about the Christian messiah over a millennium ago, allowing us to understand how far the Christian faith has come and how much the religious institution evolved since then.